Shoes. They are my nemesis when it comes to organizing. I am the only girl in a household of three boys and yet all of us own way too many shoes. My husband is the opposite of a fashionister and yet the man owns at least 15 pairs of shoes! And all of them somehow (no matter what system I try and implement and enforce) congregate and party by the front door. 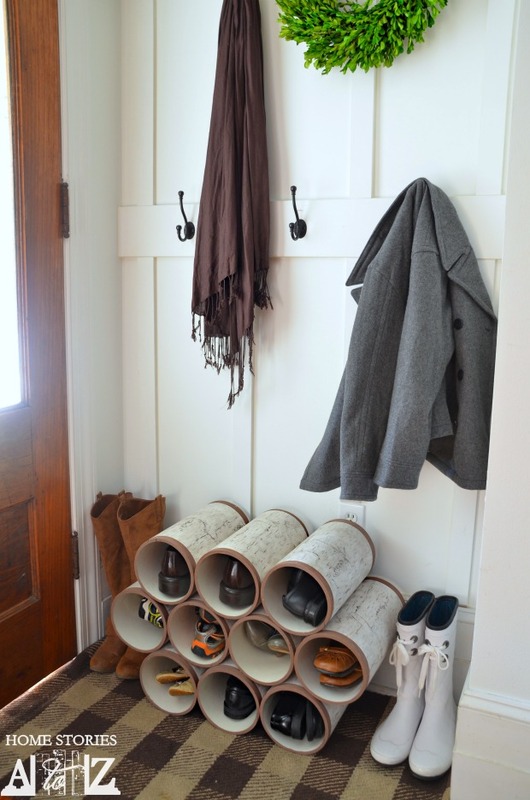 I bought a shoe organizer for the front coat closet where most of our shoes acceptably hang out, but I desperately needed a system for our mudroom. It needed to be affordable, easy to use, functional, and cute. 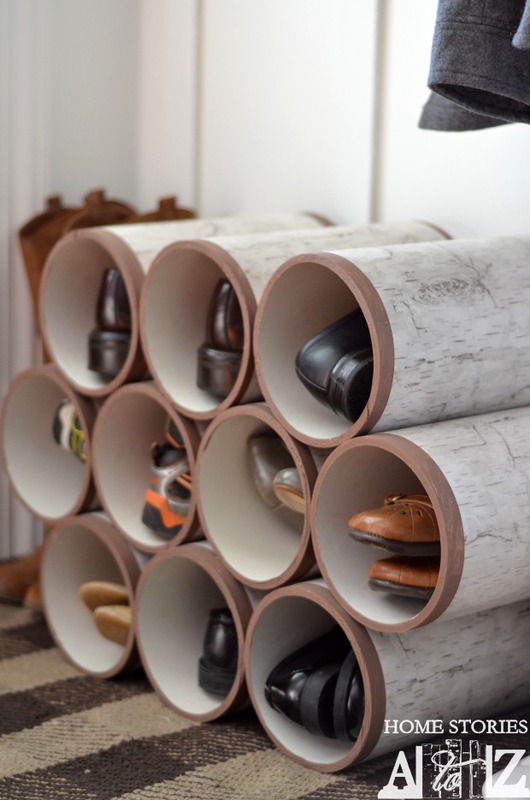 I decided to make a faux birch bark PVC pipe shoe organizer to fulfill all of my criteria! Today I’m showing you how to make one too. 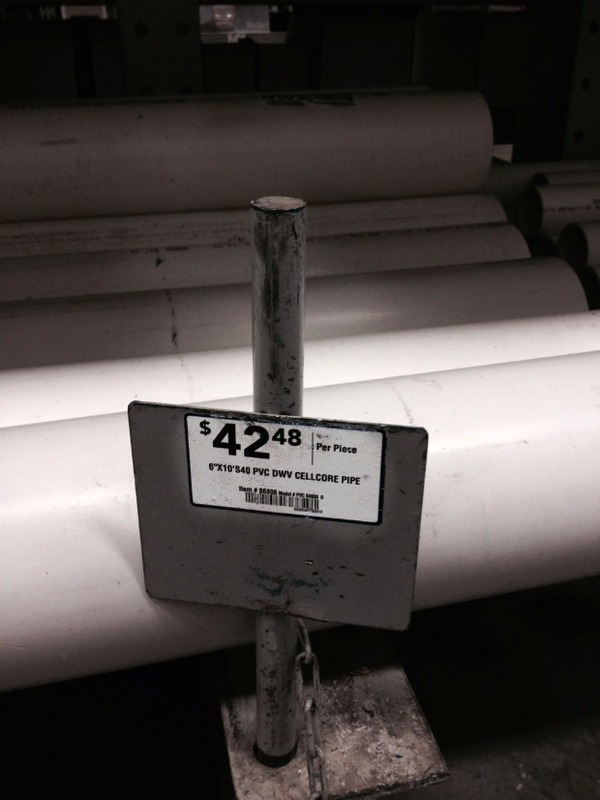 I purchased a 6″x10′ PVC pipe at Lowe’s for $42.48. (It might be half the cost of that depending on where you live. Prices vary from state to state.) I asked a friendly Lowe’s employee if he would cut the pipe into ten 12″ pieces for me. (Tip: If you wanted to get two more shoe slots out of the deal, cut the pipe in twelve 10″ pieces instead.) Now before we go any further, and before you throw a shoe at me stating that your Lowe’s wouldn’t cut the pipe for you, please note that they MIGHT NOT CUT IT FOR YOU. It is a courtesy and if they are too busy they might say no. So be sure to ask nicely and ask on a day when things are slow (i.e. not on a weekend). I paid for my pipe first and then offered to come back and pick up my cut pipe later on–giving the employee plenty of time to cut the pipe in his own time. He cut it by hand using a hack saw and said it took about 30 minutes. Cutting PVC pipe by hand is a pain in the bum, and I was nervous to try and cut this myself with my chopsaw. Thank you Lowe’s for such great customer service! Next, I washed all of my pipe pieces using dish soap and a scrub brush. I knew I’d be covering the pipes so it wasn’t important to me to get the scuff marks off, but a magic eraser will take them right off. After they are clean, you will want to sand all of the rough edges. I used 220 grit sand paper and smoothed each end by hand. To make my PVC pipe look like logs, I painted each end brown using acrylic craft paint. This paint can be scraped off, so if you want paint that better adheres use a good adhesion primer before applying your paint. I was being lazy. Lastly, I covered my pipe with birch bark wallpaper. I had purchased the wallpaper off of ebay several months ago with a different project in mind. That project never materialized so my wallpaper was just waiting for creativity to strike! I cut the paper to size, wet it, and applied it to each log. 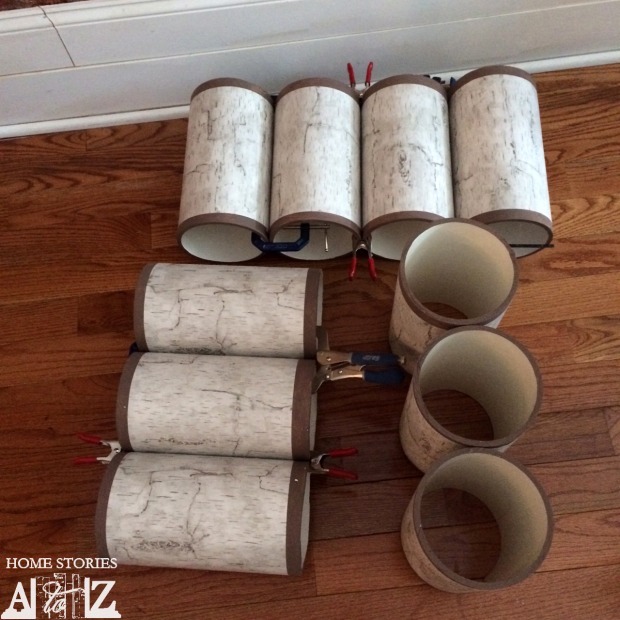 Be sure to leave a seam open exposing some of the PVC pipe when you apply your wallpaper so that you are able to glue your logs together with PVC glue. Otherwise you will be gluing wallpaper together which will rip and not hold. Glue the logs together using PVC glue and clamp in place. I left my logs to dry overnight. 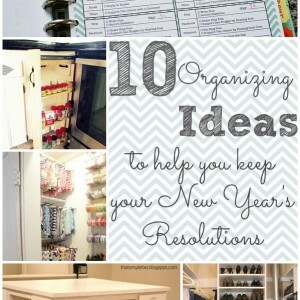 Stack them in place and enjoy your cute and organized shoes! I was able to fit 9 pairs of shoes easily into my organizer. Matt’s shoes are too big to fit both into a pipe but the boys’ shoes and my shoes fit nicely. 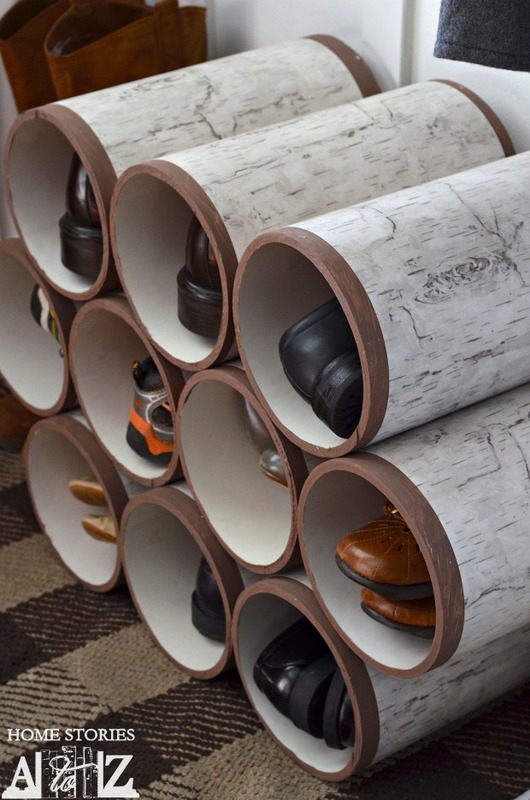 I wanted the shoe organizer to resemble a cute stack of birch logs. I’m pleased with how it turned out! 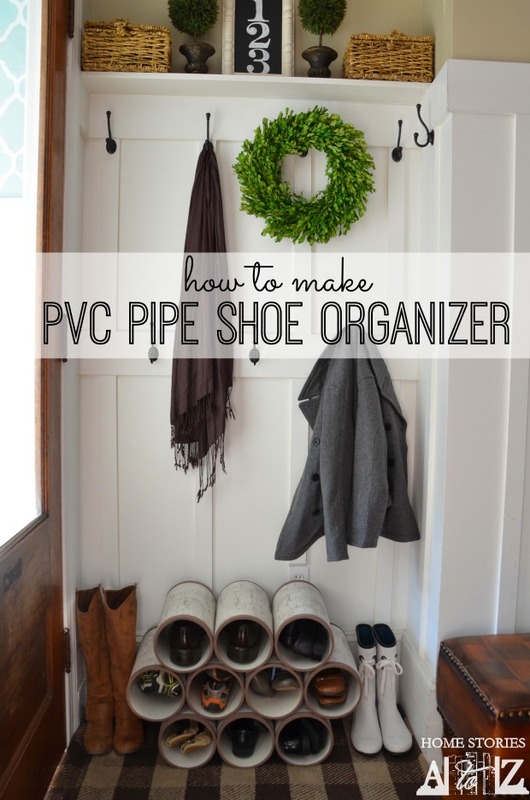 I am hopeful that this will help us contain some of the shoe clutter this winter! I completed this project as part of a Lowe’s challenge through the Lowe’s Creative Ideas Creators and Influencers Network. 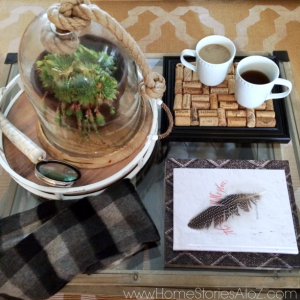 You can find more DIY ideas at Lowe’s Creative Ideas. Follow Lowe’s on Instagram, Pinterest and sign up for the Creative Ideas magazine and app. Many bloggers are featured each month on the app! *Disclaimer: As a member of the Lowe’s Creative Ideas Creators and Influencers network, I received a Lowe’s gift card to complete this challenge. All ideas and opinions are always my own. Thats actually a great idea! I tend to have loads of offcuts leftover from work aswell. I am thinking of doing this project for stuff over the holidays. Thanks for your great tutorial. Really cool! I want to build one for my wife. Shes worried about mud and water staying inside the tubes and having to clean them. Has this been a problem for you? I have had to wipe them out on occasion but it hasn’t been a big deal at all. Very nice idea, but you spent way too much on the PVC, schedule 80 would have worked just as well and it’s 1/2 the price. Promises included increasing the efficiency of distribution, disintermediation, reducing marketing and procurement costs, and decreasing errors in data distribution. They did so, and were smiling as they stood in front of me. Next, complete the “Human Test” and click the button “Check Title & Start Writing”. Very creative and a nice space saver! Wow, this shoe organizer is awesome! 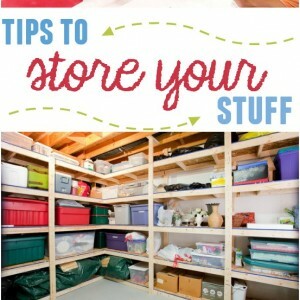 I was just talking to the hubs yesterday about how we need to make a new one once we move, and this idea is genius! I especially love the wallpaper you used. Love this idea! I would probably have to buy out their whole supply of pipe…. Great idea Beth. I have a friend who is looking for a shoe organizer, I am going to shoot this right over to her. Very very cute idea! The look a like logs is adorable. Really cute idea Beth! Love that they look like birch logs!